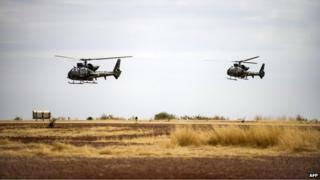 French forces have bombed Islamist militant positions in northern Mali. Four or five bombs were dropped in the Esssakane region, west of the city of Timbuktu on Sunday morning, the BBC's Alex Duval Smith in Mali reports. The UN has said al-Qaeda militants were active in the area. Last month Timbuktu airport came under rocket attack. France intervened in Mali in January last year to try to drive out al-Qaeda-linked groups, which had taken over the north of the country. Last month the French government said it was setting up a new military operation to stop the emergence of jihadist groups in the Sahel region of Africa. Both ethnic Tuareg separatists and al-Qaeda-linked militants are operating in northern Mali. Tuareg rebels agreed a ceasefire with Mali's government in May, and the two have been holding peace talks in Algeria. Analysis: How serious is Sahara threat?